Editor’s Introduction: From an anthropological perspective, “education” embodies more than just formal schooling. In this post from Lina Abirafeh, a Gender Based Violence specialist working with the United Nations, we are introduced to the kinds of collaborative, culturally responsive campaigns designed to promote gender equality and end violence against women in the Middle East. To “educate” here means to inform, persuade, and empower people to challenge inequality in ways that are meaningful and important given specific social, cultural, and religious contexts. Participants of the Organize Support Groups for Women Victims of GBV training simulating a support group session among Syrian refugee women. Photo by Lina Abirafeh. The so-called “Arab Spring” seems to have sprung over Lebanon. Not only has the Arab Spring proved false for women’s rights, but Lebanon has been largely unaffected by regional movements for democracy and human rights. Or has it? Lebanon has been, and continues to be, a country affected by violence – across its borders, within its own boundaries, and in its own homes. In such a context, it might seem that working to end gender-based violence, and particularly working with men, is an impossible strategy. In addition, this is colored by the perception that any such work is “imported” and imposed as part of a clandestine imperialist strategy, and therefore strongly resisted. Have Lebanese masculinities been transformed as a result of years of conflict? Are they continuing to transform in these times of so-called peace? With all of this in mind, approaching men from a positive, pro-active standpoint is a revolutionary strategy not just for Lebanon but for the Arab world as a whole, where, by and large, the international community has been treading lightly (and perhaps often clumsily) around gender equality due to politico-religious and so-called cultural considerations. In the aftermath of our so-called Arab Spring, Arab women continue to embrace human rights and equal rights and to foment peaceful revolutions on our own terms. If women don’t feel safe – then no one is safe. This entails engaging our Arab brothers in creative and meaningful ways. There are dynamic women and men working at the forefront of this peaceful battle, and organizations that are supporting them. ABAAD is one such organization – a resource center for gender equality based in Lebanon and serving the Middle East and North Africa. We at ABAAD embrace the belief that human security involves engaging men in positive, meaningful ways. This untapped energy – born in a time of transition – is the strongest way to bring about change. The word abaad means dimensions in Arabic. We feel that this reflects the spirit of this small but powerful organization. In Lebanon and throughout the Arab world, activism takes many dimensions. These highly-politicized – and often polarized – societies have struggled with notions of women’s rights, intertwining movements to achieve gender equality with nationalist and religious tensions. In this challenging landscape, we need to employ diverse dimensions to generate the change we seek. ABAAD is a non-profit, non-political, non-religious civil association that aims to promote sustainable social and economic development in the Arab world through protecting and empowering marginalized groups, especially women. ABAAD expands dimensions as a leading resource center on gender equality and gender-based violence in the region, espousing the belief that gender equality is an essential condition to sustainable social and economic development for the region. ABAAD creates new dimensions where women are empowered, and where women and men live as equal partners with equal access to resources and opportunities. Ending poverty and inequality in the Arab world requires working across many dimensions. ABAAD seeks to promote women’s equality and participation through policy development, legal reform, gender mainstreaming, engaging men, eliminating discrimination, and advancing and empowering women to participate effectively and fully in their communities. ABAAD also seeks to support and collaborate with civil society organizations that are involved in gender equality programs and advocacy campaigns. The driver behind this movement – and the critical ingredient to ABAAD’s success – is a high-calibre technical team of activists, lawyers, social workers, researchers, and an army of committed individuals who believe that equality is possible – and who believe in ABAAD. ABAAD brings together this dynamic pool of resource people dedicated to bringing dimensions of gender equality to life. Together, this team is creating a world where men and women live as equal partners and work together to build a future where all are empowered and participate equally in decisions affecting their lives and their communities. ABAAD believes that multi-dimensional strategies are required to bring our vision to life. We promote dimensions of policy development and dialogue to ensure that women’s rights are protected, build dimensions of organizational capacity to enhance community-based work on gender equality, strengthen the rule of law to protect women from discrimination, and engage men and boys in preventing all dimensions of violence. This is the foundation for dimensions of positive change across the region. ABAAD espouses the belief that males are an untapped source of energy to advance the agenda of non-violence – in the home and in society at large. The case for working with men is not new – and many countries are well ahead of Lebanon in this regard. But ABAAD is fostering a home-grown movement to inspire men and boys to champion women’s empowerment and to end violence. To this end, ABAAD has undertaken campaigns, studies, and programs that build on indigenous understandings of gender issues and engage males in a positive, pro-active manner. We have learned that blaming and shaming does little to bring women and men together. Rather, ABAAD seeks to engage men and boys as equals. A nationwide campaign organized by ABAAD in October 2011, driven by men, for men – “With all my force… against violence” – has taken hold in Lebanon. Advertisements have appeared on TV, You Tube and billboards throughout the country. And other men are beginning to take notice. This media campaign began the revolutionary journey towards using positive psychology to foster male allies in the fight for women’s rights as human rights and equality for all in Lebanon. Rather than employ outdated strategies of blaming-and-shaming, this campaign chose not to see men exclusively as perpetrators but also as partners whose engagement is critical to ending intimate partner violence – and violence against women more broadly. Through television advertising, billboards, newspapers, flyers, posters, SMS messages, and awareness raising activities, this campaign supported men who, like their female counterparts, refuse to remain silent about violence against women and gender inequalities in Lebanon. 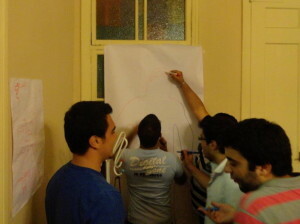 Syrian men and boys affected by GBV participating in a body image and stress management exercises as part of a psycho-social support group session. Photo by Lina Abirafeh. The media campaign led to the creation of a Men’s Center – a space where men receive free, anonymous, individual counseling and support and can participate in workshops and events – such as the multi-media advertising campaign against violence. The Center is a joint creation of ABAAD and International Medical Corps (IMC) to help men and male youth address issues of violence in their homes and communities. Participants self-identify the causes of violence in the home, and use this as a launchpad to address communication and behavior, and ultimately non-violent problem-solving strategies. This in turn builds healthy relationships – and healthy societies. Giving male participants the lead in selecting issues to address ensures that they also take ownership of the solutions. These practiced positive approaches are then automatically relevant to the context – and are more sustainable. This was not an easy strategy – and resistance was inevitable. Lebanese understandings of masculinities do not necessarily create the space for dialogue – particularly on personal issues. However, after initial reticence, participants grew to appreciate the space and the freedom it offered them. They build new peer groups and social support structures and together they found creative solutions from within, rather than through external imposition. In a closing survey, 94% of the participants felt that this platform offered them the space to express opinions and seek support on sensitive topics. They had never had this opportunity before. We at ABAAD believe that the focus cannot be on the individual, but on the learned behaviors – in a non-accusatory and pro-positive way. The Center takes a holistic “lifestyle approach”, encouraging men to adopt healthy alternatives and solutions and explore alternate ways to exercise masculinity, building on positive aspects of Arab socio-cultural contexts. The Men’s Center is being promoted as part of a nationwide media campaign entitled “We are willing – and here – to listen”. And it is working. Arab women will continue to fight for equality – but we have also come to realize that we cannot do it without the support of men – as partners, advocates, and champions. And we cannot do this unless it is on our own terms, in our own space, and at our own pace. In so doing, we are keeping the principles that underlie the Arab Spring alive in Lebanon, and across the Arab world. We are ALL essential ingredients in this movement. Gender equality benefits all of us – and together we can bring it to fruition. We invite you to join this movement and work to build a community where dimensions of peace and equality are a reality. ABAAD and IMC (2013): Masculinity and Violence Against Women: Lebanese and Iraqi Samples, January 2013. Abirafeh, Lina (2012): Dimensions of International Women’s Day: Engaging Men to Achieve Human Security in the Arab World, in Connect Magazine: Celebrating the 100th Anniversary of the International Women’s Day 2012. This figure was obtained from ABAAD’s internal monitoring and evaluation studies. This entry was posted in Education and tagged Anthropology, Education, gender, Middle East, violence.